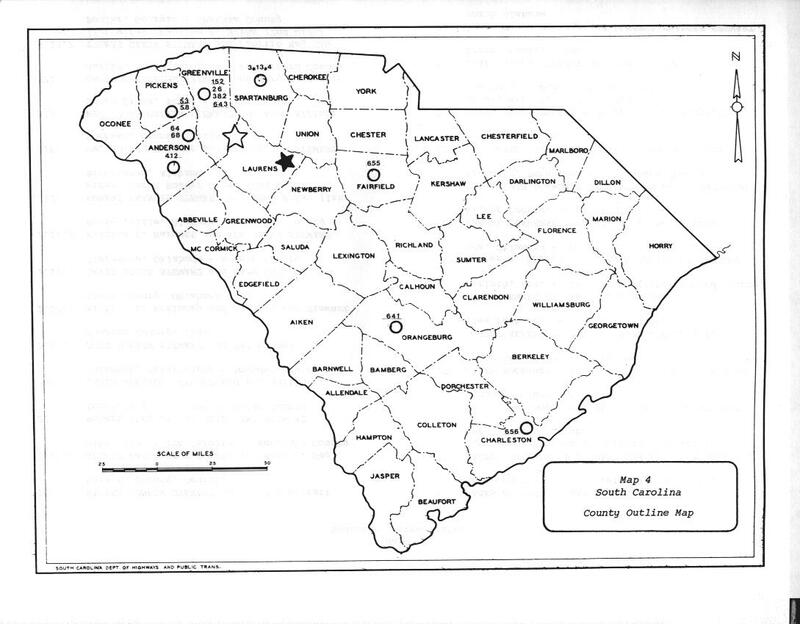 There are a great number of locations, landmarks, and homes related to the Walter Stewart Clan in the upcountry area of SC. 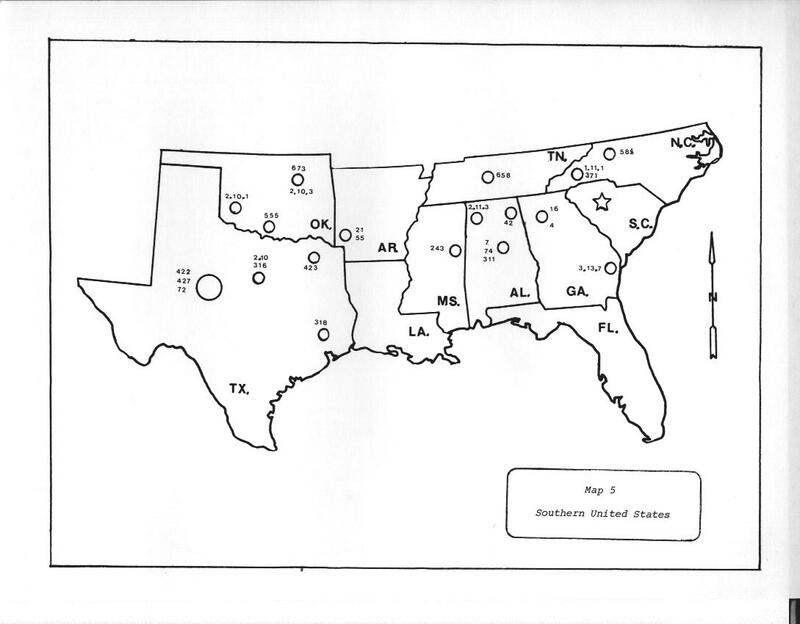 Some locations are approximate because the buildings are no longer standing, while other locations, such as homes and churches, are still standing, and are slightly more accurately marked. 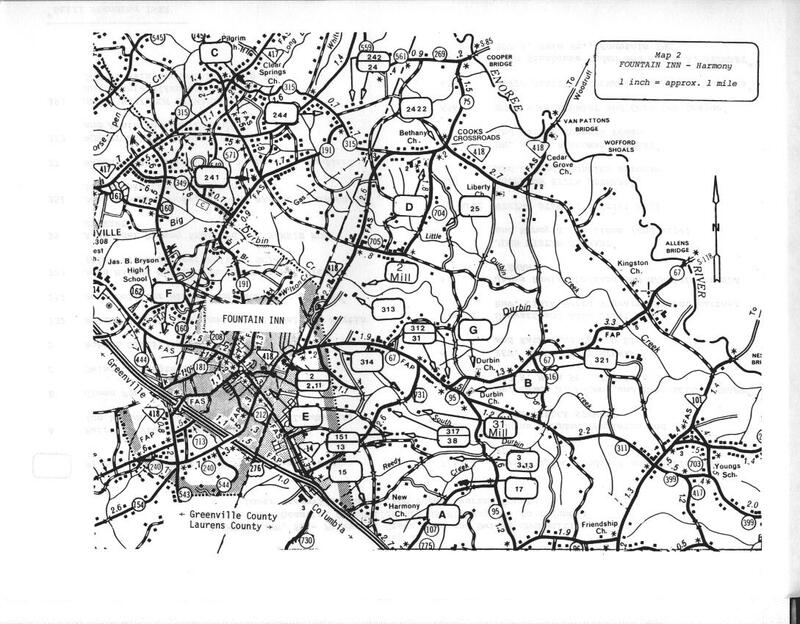 Below are scans of maps from the appendix of the 1982 book, The Walter Stewart Family History. Below that is a Google Map that attempts to reproduce the locations from Maps 1-3 in a more accessible format. There are also photos and videos of some of the locations, contributed by 151222 John Hellams and 351231 LaMarr Brooks. Each location below is linked to an album. Some other related photos are published in the Photos area of the website, specifically in the Saturday 2009 album. ** Private hunting preserve in 1982. 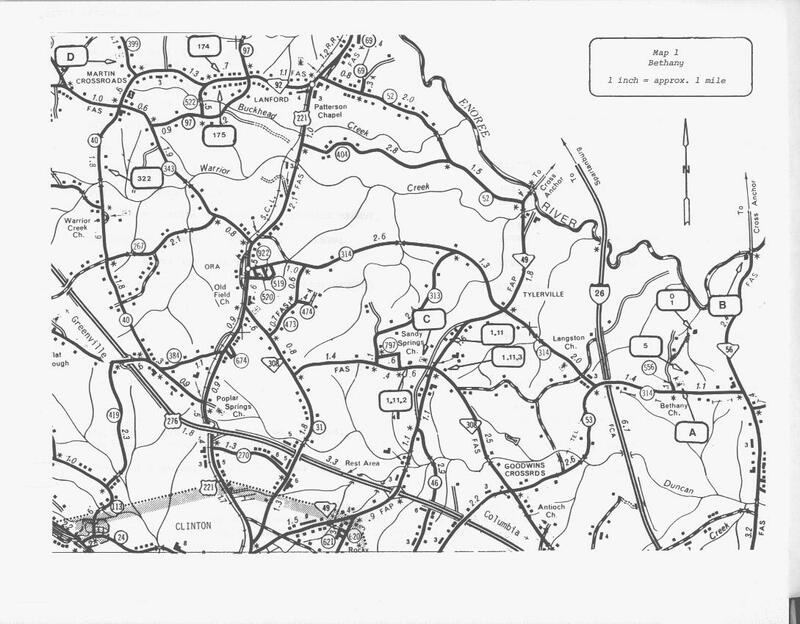 The oldest family records say Walter Stewart, Sr. lived "about a mile from Bethany Church towards the Enoree River, on the left of the road leading to Flat Rock." Exact location of Flat Rock not certain; probably a ford on the Enoree River. We think 1 Samuel's house was up the hill to the right of the barn now standing on the hunting preserve property. Many years ago there were several old houses in this area. Fairview Presbyterian Church has been a significant location for the Walter Stewart Clan for many years, since long before the First Reunion in 1907. In 1855, 6 Reverend Clark Berry Stewart accepted a pastorate that he was to serve for his remaining active years through 1883, Fairview Presbyterian Church in lower Greenville County. This church, established in 1786, was in the midst of a very prosperous farming area and was rapidly outgrowing its limited facilities. In 1858, Clark Berry joined the dedication of a new and larger building, complete with two galleries. Fairview continues to serve an active congregation today, and has recently grown with the addition of new facilities. The Stewart Reunion has historically been held here in alternate years (the even-numbered years). Many Stewart cousins, including Reverend Clark Berry Stewart, are buried in the adjacent cemetery. Click here to see the photo album. The First Reunion of Walter Stewart's descendants was held at New Harmony Presbyterian Church, October 17, 1907 and Stewart Reunions are still held there to this very year. In 2007, the Walter Stewart Clan celebrated their 100th Anniversary Reunion at New Harmony Presbyterian Church. This church was organized August 13, 1844. Harmony Baptist Church organized February 1845 at the same location. Both denominations have used this building continuously from 1845 to the present. The 1st Harmony School was located where the picnic tables are � behind the church to the right. The 2nd Harmony School was constructed in 1911, where Pleasant Grove Baptist Church is located, a few hundred yards away. Pleasant Grave Baptist Church was organized in the 2nd Harmony School building. There are more Walter Stewart descendants buried in the Harmony Cemetery than any other place. 3 Robert Stewart, who died March 25, 1845, was the 1st person buried in Harmony cemetery. (Burial Records) 3.13 Samuel Turner Stewart, infant son of 3 Robert Stewart, was baptized 1 week after his father's death (along with 3 other children) in New Harmony Presbyterian Church. Click here to see the photo album. This site, currently a vacant field at the corner of Reedy Creek Road and Thompson Road, was first owned by Benjamin Newman, husband of Rachel Ross Stewart 15. Rachel Ross Stewart passed away before the Civil War and was buried at Bethany, but their three young children were cared for in this area during the Civil War, and Benjamin Newman settled here after the Civil War. The property passed down the line of 151 Margaret Caroline Newman and John Thomas Farrow, to 1512 Mittie Emma Farrow and Richard Allen Hellams, to 15121 Bertha Lee Hellams and husband Harold Lee Thompson, to 151211 Robert Lee Thompson and wife Lilla Louise Rodgers. The property is still in the Stewart family and is now owned by 1512111 James Allen Thompson and wife Catherine Joyce "Kitty" Moore. Click here to see the photo album. 13 Mary Ann Stewart and her husband Isaac R. Henry first lived on this site at 1118 Thompson Road (but not in this relatively recent building). The land passed down through 132 Robert Leland "Land" Henry, and 1328 Clark Stewart Henry, to 13285 Othello Grace Henry Kay and husband Joe Crayton Kay. The home shown on the original property is now the home of 1512111 James Allen Thompson and wife Catherine Joyce "Kitty" Moore. Click here to see the photo album. This house is the third one which was built on the 400 acre property currently at 2384 Thompson Road, which was purchased by 3 Robert Stewart upon his move from the Bethany community to the New Harmony Church area. This house was built in 1859 by Robert's wife Rachel Gilliland Stewart and their children after his death in 1845. Click here to see the photo album. This property at 743 Stewart Road near New Harmony Presbyterian Church was part of the original 400 acres owned by 3 Robert Stewart. The first Stewart known to have lived here was 38 James Preston Stewart who married Martha Anne Elizabeth Cely. They lived first in a log cabin, and later in a two-story farmhouse, where they reared their family of one daughter and three sons. 384 William Franklin "Little Will" Stewart and his sister 381 Dora Jane Stewart continued to live at the old homeplace after the death of their father in 1909 at age 72. This land backs up to the property of 31 William "Squire Bill" Stewart and 317 William Clark "Big Will" Stewart. In 1917, Little Will married Lucy Allen Peden. And they raised their family of three sons and two daughters at this home. Today their daughter 3845 Lucy Peden Stewart owns this property. Click here to see the photo album. John Thomas Farrow returned from the Civil War, and in 1869 married 151 Margaret Caroline Newman. They lived for some time in nearby Pelzer in Anderson County, returning in later years to live in the Harmony community in this house at 392 Stewart Road built for John Thomas by his brother, Jefferson Marion Farrow ("General"), who was a carpenter, near Harmony Baptist Church, where Caroline and John are buried. Their only surviving son, Thomas D. Farrow ("T." Farrow), never married, and lived for many years at the old homeplace until his death in 1941 at age 61. He is also buried at Harmony Baptist Church. 151222 John Thomas Hellams (who was instrumental in obtaining the information and media on Stewart locations) is descended from 151 John and Caroline Farrow via 1512 Mittie Emma Farrow and 15122 Raymond Farrow Hellams. Click here to see the photo album. This property at 1958 Hunts Bridge Road near New Harmony Presbyterian Church was also part of the original land owned by 3 Robert Stewart. This location on South Durbin Creek was first the home of 31 William "Squire Bill" Stewart who married Rebecca Stoddard. This land backs up to the property of 38 Robert Preston Stewart and 384 William Franklin "Little Will" Stewart. It was passed on to 317 William Clark "Big Will" Stewart who married Jincie Wheeler Ballenger. 3171 Chief William Tinsley Stewart (1896-1984) and his six younger sisters were raised here. William Tinsley Stewart went on to marry Mabel Moore and had four children, all raised in nearby Woodruff, S.C. 31712 Charles Ballenger Stewart is currently Chief of the Stewart Clan and 31714 Dr. Mary Stewart Newton is Chief Historian and author of the Stewart Family History. Click here to see the photo album. This property at 2651 Durbin Road is also in the Durbin Community near New Harmony Presbyterian Church. The first Stewart known to have lived here was 312 Alexander Baker Stewart who married Ella Ann Owings. The Baker Stewart homeplace still stands at the three-prong crossroad in the Durbin community near Fountain Inn. 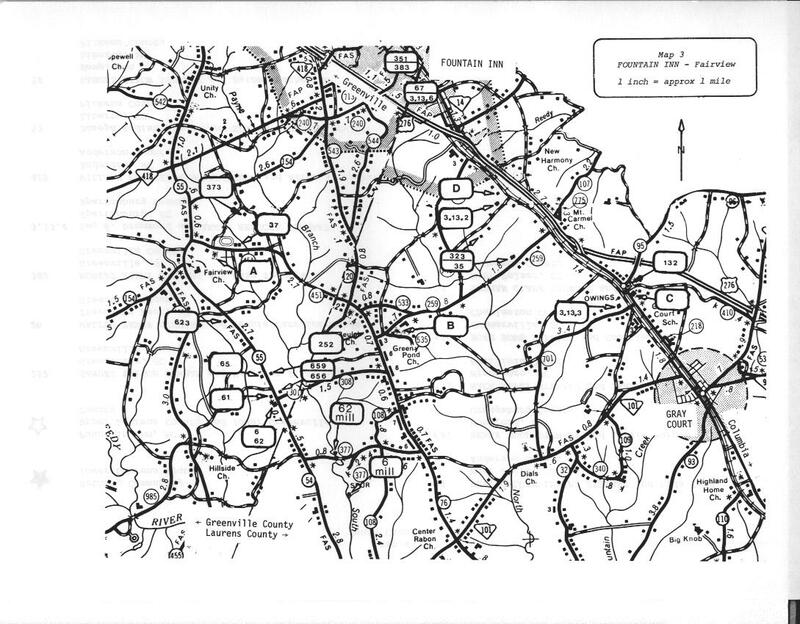 At age 22, Baker bought 66 acres of land beside his father's property. Here he set up not only a grist and flour mill later operated by his bachelor brother, 319 Jim Stewart - but also built a country store, which for many years was the Jakin (Durbin community) Post Office, later known simply as Stewart's Store. Jakin was the community that preceded Durbin community. The thick-walled old concrete building that housed his store is still standing near his home in the Durbin community, although the building has been unoccupied for many years, except for storage. Baker prospered in this location, eventually adding more land, a cotton gin, a dairy, and one of the first peach orchards in the area to his various enterprises. In 1888, Bake married Ella Owings Fowler and built a large modern one-story house on his property. Bake and Ella reared their family of two daughters and a son in this home. Their son 3123 Wayne Dial Stewart and Mary Eliza Curry also lived here. Wayne and Mary's son, 31235 Douglas Wayne Stewart, Treasure of the Walter Stewart Clan, lives here today. Click here to see the photo album. This house at 2406 Fairview Road near Fountain Inn (near Fairview Presbyterian Church) was built by Tully C. Bolling (not a member of the Stewart Clan) about 1840. 6 Clark Berry Stewart purchased the large two story brick home with about 500 acres of land and moved here from his small farm some seven miles northeast of Fountain Inn farm to be closer to Fairview, where he was pastor from 1855 to 1883. The house is about three miles from the church. Clark Berry lived here with his wife Katharine Carson Hitch from 1859 to 1890, raising a family of eight children, of whom one died in infancy. The house survives, happily overlooked by Sherman's Army by only two miles, and has been restored to its original simple elegance after forty years of neglect. It is now known as "Tullyton" and owned by Dr. Jim Richardson. It was recorded in in 1990 on the Register of National Historic Places as Tullyton (Bolling-Stewart House). The detached kitchen-servant quarters with its four beautiful fireplaces remains only a ghostly shell, a mute reminder of a different way of life. Reverend Stewart is buried at Fairview Presbyterian Church. The house was passed to 62 John Wistar Simpson Stewart (married to Margaret Louise Anderson), then to 622 Catherine Rachel Stewart (married to Charles Lindsay Peden), then to 6221 Catherine Charles Peden. The house is no longer in the Stewart Clan. Click here to see the photo album. 65 Dr. Henry Boardman "Bordie" Stewart was the fifth child and third son of Katharine Carson Hitch and Rev. Clark Berry Stewart, founders of the House of Clark. He and his wife Martha Eugenia Peden lived here at 2244 Fairview Road and raised a family of nine children, of whom one died in infancy. Dr. Bordie was the quintessential "country doctor" to the Fountain Inn community for 65 years. In 1918 Dr. Bordie was elected fourth Chief of the Walter Stewart Clan and served in this capacity until his death in 1947 at age 92. His 29-year term was the longest of any of the six Stewart descendants to serve as head of the Clan to date. His wife Eugenia died in 1932 at age 73. Both are buried at Fairview Presbyterian Church. The house passed down his family to 659 David Dantzler Stewart (married to Fannie Fair Parkins) and 6591 Frances Fair Stewart (married to Grayson Gallman and now to James Rodgers). As of very recently, the house is no longer in the Stewart Clan. Click here to see the photo album. Fairview- I, Fairview- II, New Harmony, Home of 15, Home of 3- I, Home of 3- II, Home of 3- III, Home of 38- I, Home of 38- II, Home of 151, Home of 31, Home of 312- I, Home of 312- II, Home of 6, Home of 65.